The walks that Francis Alÿs has set out on for the last 15 years never imply a final destination. The Belgian-born artist’s perambulations are instead both their own measure and a measuring of the surrounding city. In The Collector (1991-2), Alÿs pulled a magnetic toy dog through the streets of his adopted home of Mexico City until it became quite covered in keys, shards, and coins – the detritus of the metropolis. This attempt to clear a path in the wake of a journey was followed by a comic approach to marking one’s route, with Alÿs crossing the same city wearing a knitted sweater that gradually unraveled as he walked (‘The Winner/The Loser’, 1995). 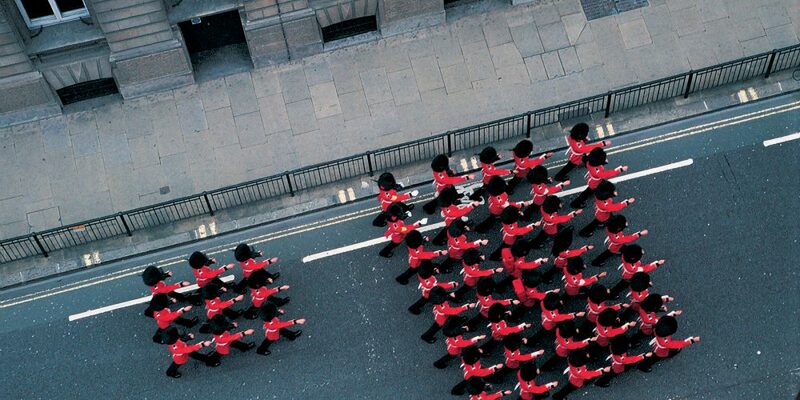 For seven years, Alÿs walked the streets of London. The ambitious Seven Walks (2005) project, a collaboration with Artangel, gently intervened into the city’s daily patterns and rituals. Each walk was enacted in a different part of London – parks, the National Portrait Gallery, and quiet streets – with the ensuing films, paintings and drawings comprising Alÿs’ first major exhibition in the UK. For ‘The Guards’, supported by Outset, the artist passed on instructions to a troop of 64 Coldstream Guards to take one of many pre-planned routes through the city. When one soldier met another, they were to march together until they met another soldier or group. At the point when the entire troop was in formation, they marched to the nearest bridge and then dispersed, breaking from anonymous military mass to individual agents.? ?